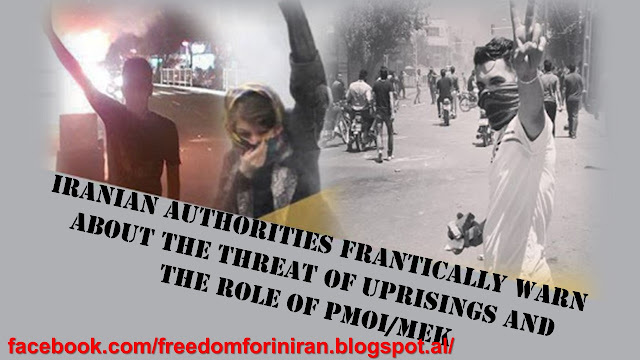 Angry locals in Andimeshk clash with state policeMarch 21, 2019 - Tensions began flaring in the two cities of Dezful and Andimeshk of Khuzestan Province, southwest Iran, as locals were seen clashing Wednesday afternoon with state police and members of the Revolutionary Guards (IRGC) Basij paramilitary forces, only hours before the beginning of the Iranian calendar new year. Reports show a number of regime agents were beaten by the protesters. 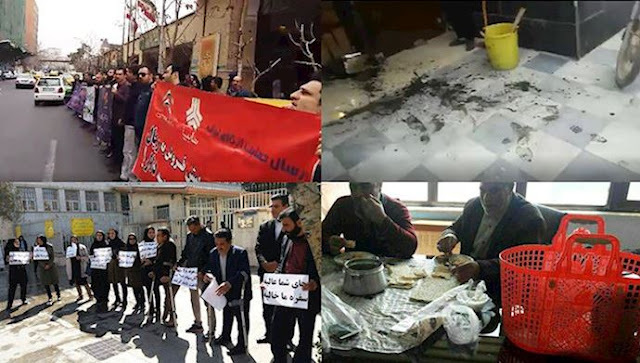 March 17, 2019 - As we inch closer to Nowruz, the Iranian calendar New Year, people from all sectors of the Iranian society are holding protest rallies demanding delayed paychecks to at least provide a portion of their families’ necessities. March 15, 2018 - As the regime in Tehran continues to destroy Iran’s economy for 40 years and counting, more people from all walks of life are holding protest rallies throughout the country. 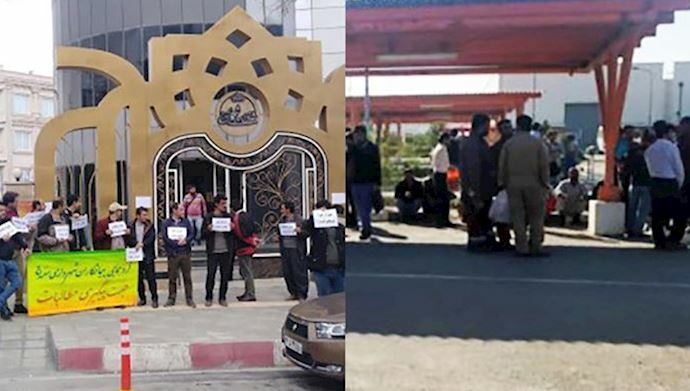 On Thursday, a large number of contract employees of phase 12 in the South Pars gas field (located between the cities of Kangan and Asaluyeh, southern Iran), currently working in the 9th oil refinery, help a protest rally once gain. They are demanding delayed paychecks and pensions. 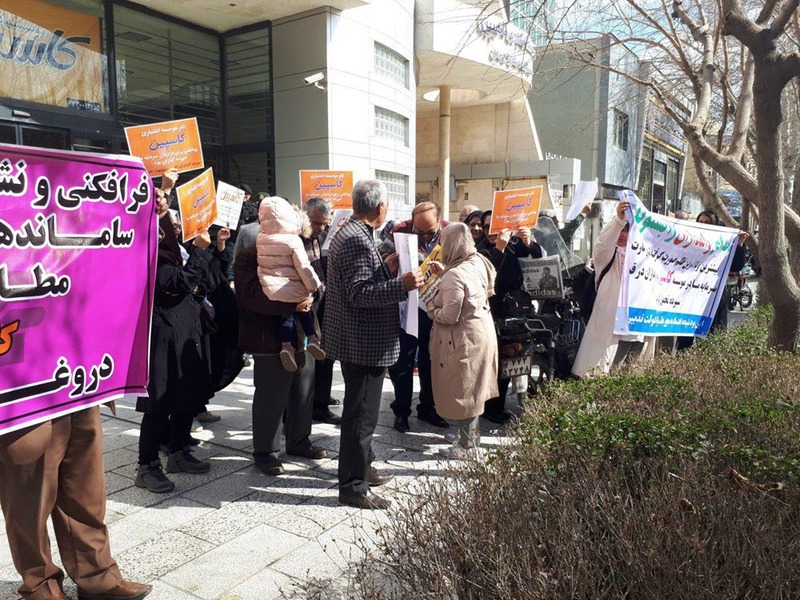 “… Our due paychecks and pensions must be paid prior to the [Iranian calendar] New Year [on March 21] so we can go home without feeling ashamed,” said one protesting worker. These protests are now expanding to the country’s energy sector, raising concerns and eyebrows among the ruling regime. 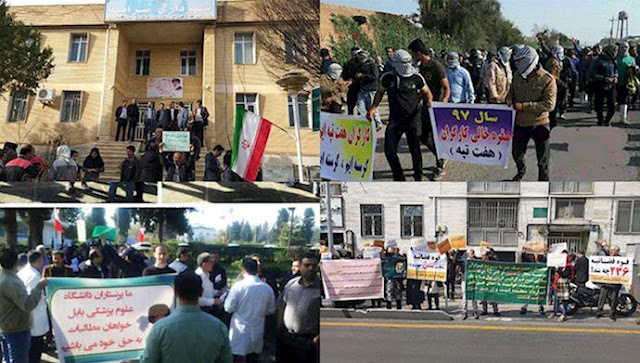 March 13, 2019 - Reports from across indicate people from all walks of life across Iran staged a variety of protests and strikes on Wednesday, making their demands heard loud and clear and continuing to protest the regime’s destructive policies. March 13, 2019 - Tuesday became yet another day that people from all walks of life across Iran were expressing their demands in increasing protests. Many workers in different sectors of the country’s economy are protesting long delays in receiving their paycheck. All the while, regime officials and their children are enriching themselves through embezzlement and corruption. March 10, 2019 - Following a week of a variety of protests reported from dozens of cities across the country, especially a three-day nationwide teachers strike, Sunday witnessed more such rallies in a number of major Iranian cities. March 7, 2019 - Teachers and educators in numerous cities across responded to a call for rallies across the country, protesting poor living conditions, low paychecks and pensions, and authorities intensifying security measures on campuses and school grounds. Another demand constantly raised by the teachers is the release of their colleagues who have been unjustly jailed by the authorities. 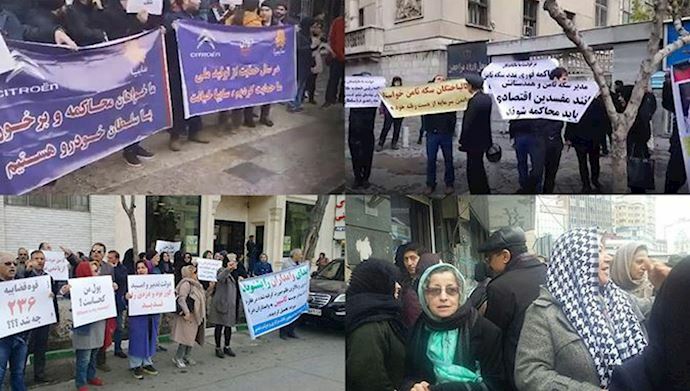 March 6, 2019 - As teachers successfully held a three-day nationwide strike and plan to stage a demonstration on Thursday, people from all walks of life in different cities took to the streets on Wednesday in various gatherings protesting the regime’s unjust policies. Hundreds of steel mill retirees in Isfahan, central Iran, held a rally and marched through the city towards the Isfahan Province governor’s office, protesting low pensions and officials’ refusal to respond to their demands. 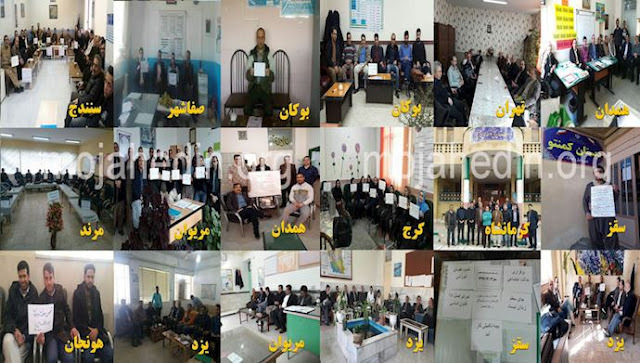 March 5, 2019 - As teachers throughout Iran continue their third consecutive day of a nationwide strike on Tuesday, cities from across the country are reporting a variety of protests by people from all branches of the Iranian society. In Mazandaran Province, northern Iran, college students of the Mazandaran Tech University protested low food quality at the self-service cafeteria. On Tuesday, teachers in at least 25 Iranian cities held the third day of their sit-in protests from early hours in the morning. The teachers, who began their sit-in on Sunday, are fighting for their most basic demands, including low wages, inefficient insurance plans, poor living conditions and very poor management of the education sector. As economic conditions in Iran continue to decline, Iranian teachers are faced with worsening living conditions. Government corruption and the declining value of the rial have played a major role in making the lives of Iranian teachers and other public sector employees harder. Despite the increasing inflation rates in Iran, the salaries of teachers and other government employees have not changed. In the past months, this situation has triggered various protests by working and retired government workers. 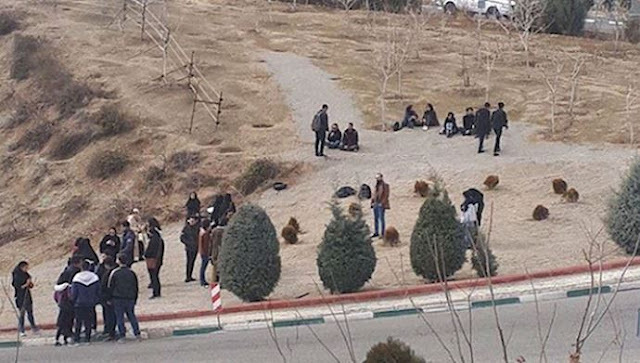 March 4, 2019 - As teachers are continuing their new round of a nationwide strike on this second day, a variety of protests are being reported by people from all walks of life in cities checkered across Iran. March 3, 2019 - Teachers and educators in Tehran and other provinces of the country, including Khorasan Razavi - West Azarbaijan - Zanjan - Khuzestan - Mazandaran - Kurdistan - Kermanshah - Alborz - Hamedan - Isfahan - Yazd - Qazvin - South Khorasan and East Azarbaijan have taken part in a sit-in protest today demanding unpaid salaries’ of the past few months. Human rights lawyer Nasrin Sotoudeh who is currently in prison, was sentenced to 38 years prison and 148 lashes. The Women’s Committee of the National Council of Resistance of Iran strongly condemns the anti-human and misogynist sentence by the mullahs’ regime. During a brief telephone conversation with her husband, Nasrin Sotoudeh asserted that her sentence is 38 years in prison and 148 lashes. 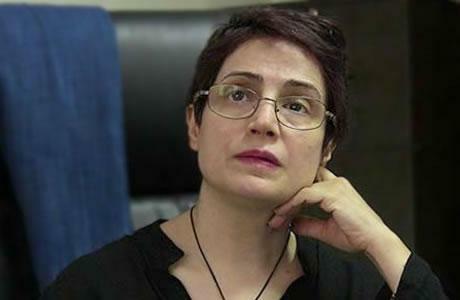 Her statement follows the judge overseeing her case reporting to the media that Nasrin Sotoudeh has been sentenced to seven years in prison. 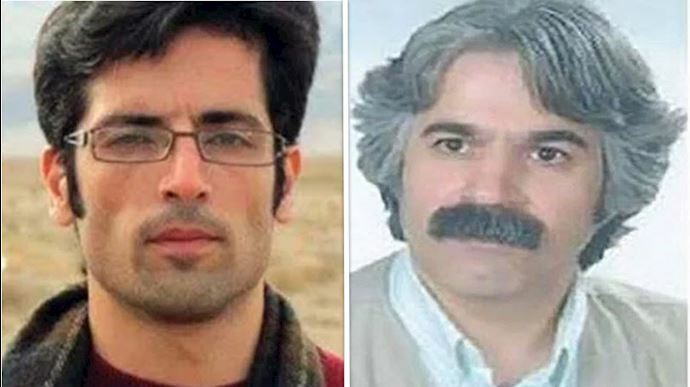 Two weeks ago, Iranian regime authorities transferred political prisoner Mehdi Farahi Shandiz to solitary confinement in the Central Prison of Karaj. Since then, Farahi Shandiz has been deprived of calls and meetings with family members, and there's no news of him, which has raised concerns about his conditions and health. Farahi Shandiz is an activist and electrical engineering graduate from Isfahan’s Industrial University. He is now in the eighth year of his prison sentence. Farahi Shandiz was first arrested in 2010 under bogus national security charges and for insulting Ali Khamenei, the supreme leader of the Iranian regime. His prison sentence was later extended from 3 to 12 years under various vague excuses. During his incarceration, Farahi Shandiz has endured different physical and mental tortures. He has also been regularly denied medical care. Farahi Shandiz has had no sort of communications with his family since February 10. On February 11, the 40th anniversary of the 1979 Revolution, Farahi Shandiz had chanted slogans of “down with dictator” and “down with Khamenei” in protest to 40 years of torture and executions under the tyrannical rule of the mullahs. After Farahi Shandiz’s demonstration, prison guards attacked him in his cell and violently transferred him to solitary confinement while beating him. 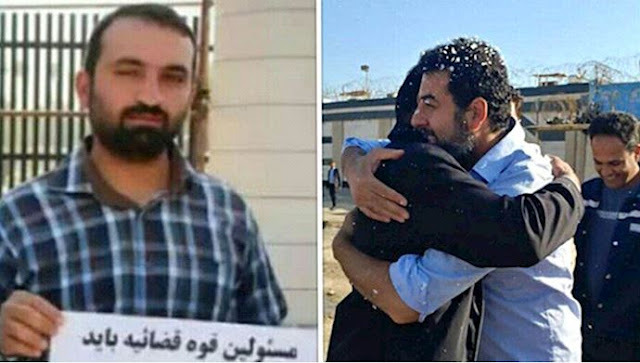 Meanwhile, Maji Assadi, another Iranian political prisoner in Gohardasht prison, is now in the third year of his prison sentence. Assadi, a university student, is suffering from different illnesses and is in need of medical care, but regime authorities are denying him the most basic needs and have prevented him from going to the hospital on several occasions. Assadi is suffering from inflammatory pain in his spine which is the result of another extended period of incarceration. In the past two years, under torture from regime officials, Assadi has suffered from ulcers and digestive complications. But regime authorities continue to torture him by denying him medical care. The Iranian regime moved a political prisoner to solitary confinement for chanting anti-government slogans last week. On Monday, February 11, as Iran marked the 40th anniversary of the 1979 Revolution, Mehdi Farahi Shandiz, a teacher, started to chant about the torture and executions carried out by the mullahs since they stole power. 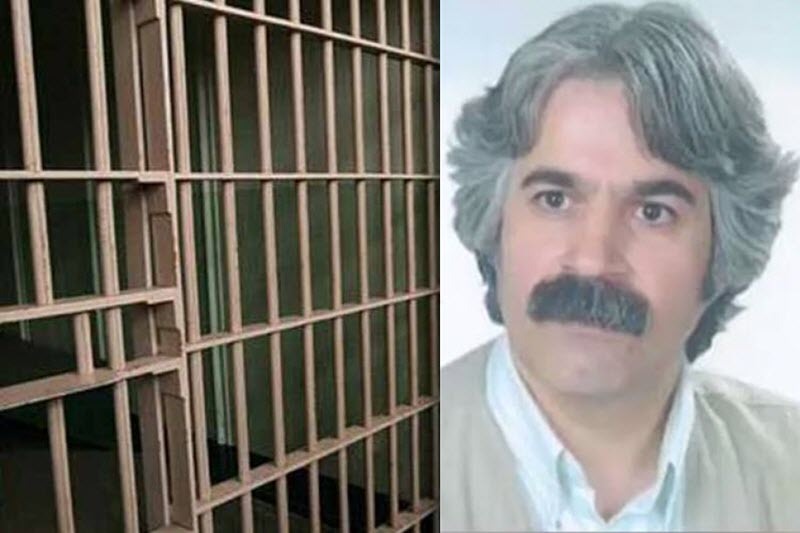 Following that, Farahi Shandiz, 57, was moved from hall 6 to solitary confinement in hall 14 in Karaj Central Prison. Farahi Shandiz, a labor activist and private high school tutor, is serving nine years in prison for three separate charges of “insulting the supreme leader”; six years are for charges brought against him since he has been in prison. Members of the Anglo-Iranian Communities and supporters of the National Council of Resistance of Iran organised a rally outside Number 10 Downing Street in London on 9 March 2019, to mark International Women’s Day. Hundreds took part at the rally in support of the brave women of Iran who are at the forefront of the ongoing popular protests and strikes against the regime across the country. 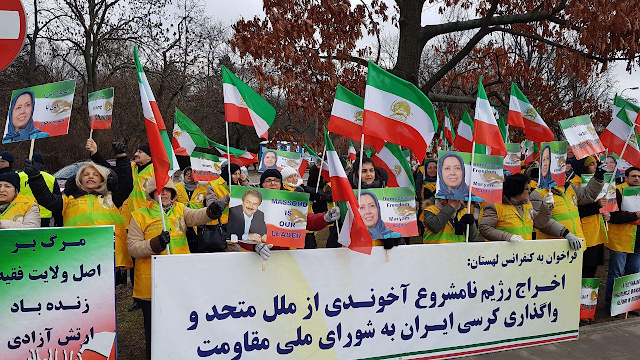 Iranians from across U.S. join Iran Freedom March in Washington D.C.
Washington D.C, March 8, 2019 - On Friday, Iranians from more than 40 states across the U.S. gathered in Freedom Plaza, Washington D.C., to join the Iran Freedom March, a rally in support of popular protests in Iran. 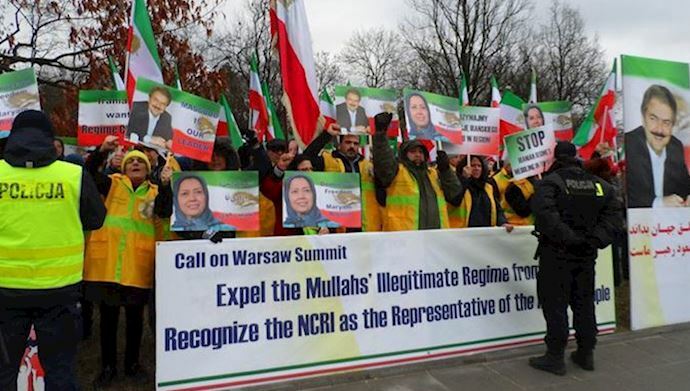 The demonstrators also voiced support for the National Council of Resistance of Iran (NCRI), the main Iranian opposition coalition which has been calling for the toppling of the tyrannical regime of mullahs ruling Iran and the establishment of a secular and democratic state. The rally took place as the past 15 months have seen ongoing protests across Iran. People from all walks of life, all segments of the Iranian society and all corners of the country have been holding demonstrations, strikes and sit-ins for their most basic rights, trampled by the ruling mullahs for four decades. The people are holding the mullahs’ regime in its entirety for deteriorating economic conditions and lack of political and social freedom. 18, 2019 - The Iranian regime’s atrocious report card of supporting international terrorism and being the world’s leading state sponsor of terrorism came to haunt the mullahs’ Foreign Minister Mohammad Javad Zarif during his visit to Germany for the Munich Security Conference on Sunday. Reporters asked Zarif about European sanctions against Tehran over the mullahs’ terror campaign on their soil, especially through the course of 2018. 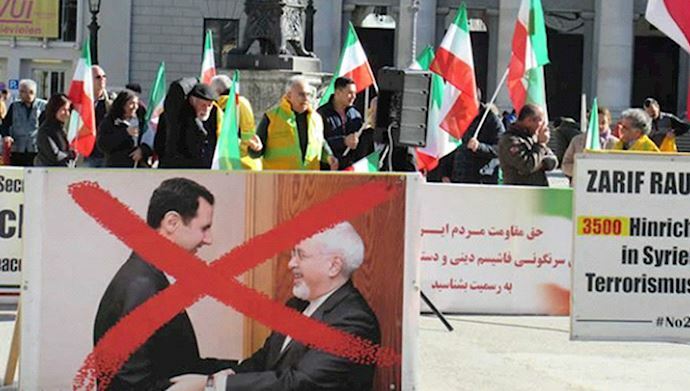 Constantly dodging questions over the Iranian regime’s bombing and assassination plots across Europe during the past year, Zarif, as always, resorted to old lies to justify these heinous measures and signaled the source of Tehran’s main concerns. 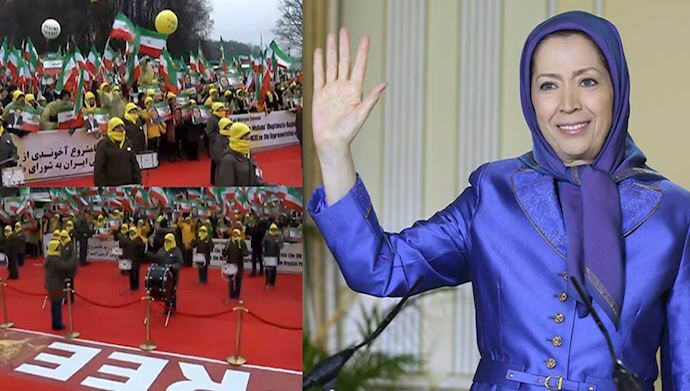 The powerful presence of the Iranian Resistance in Warsaw was very significant during the recent international conference hosted by the United States and Poland focusing on Middle East challenges, especially the Iranian regime’s malign activities across the region. 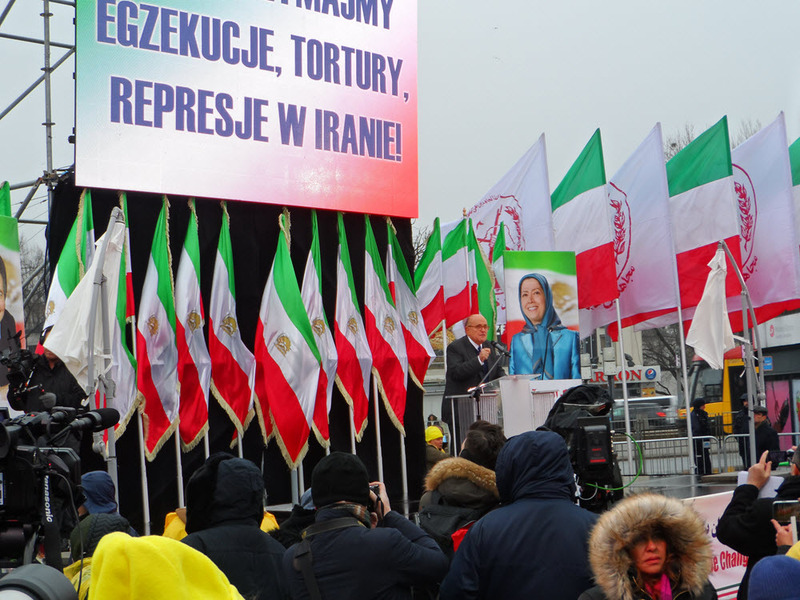 Feb. 16, 2019 - We can examine the Wednesday’s Free Iran rally in Warsaw from different angles. 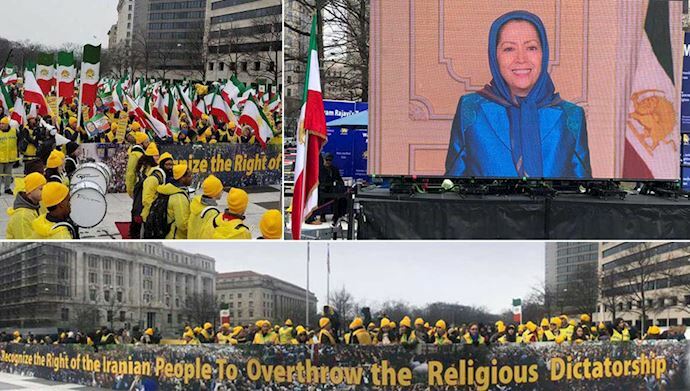 But one detail that is often forgotten is the importance of an organized Iranian opposition movement that is present on all fronts inside Iran and across the world. We must remember that in the past centuries, it wasn’t the Iranian people who decided the fate of their country. It was always regional and world powers that decided for Iran. From the Qajar to the Pahlavi dynasties, the tyrannical rulers of Iran liquidated the riches of the country to preserve their own power. And in the past 40 years, the criminal mullahs ruling in Iran maintained their rule by banking on a failed appeasement policy by the West. And they've done their own fair share of squandering the country's wealth on their own survival. Feb. 14, 2019 - Members of “Resistance Units,” a vast network associated directly to the Iranian opposition People's Mojahedin Organization of Iran (PMOI/MEK), are expressing their support for the Iranian Resistance rally in Warsaw coinciding with an international conference on Middle East issues focusing specifically on the mullahs’ regime. Feb. 14, 2019 - As ministers and officials of several countries from across the world gathered in Warsaw, Poland, to discuss solutions and roadmaps for achieving peace and stability in the Middle East, a large crowd of Iranian dissidents, supporters of Iranian opposition National Council of Resistance of Iran (NCRI) and People’s Mojahedin Organization of Iran (PMOI/MEK), held a gathering to reiterate the need to support Iranian protests and regime change in Iran. Feb. 13, 2019 - A large crowd of Iranians, supporters of PMOI/MEK and NCRI, held a gathering in Warsaw as authorities from numerous countries gathered in the city to attend a meeting co-hosted by United States and Poland. 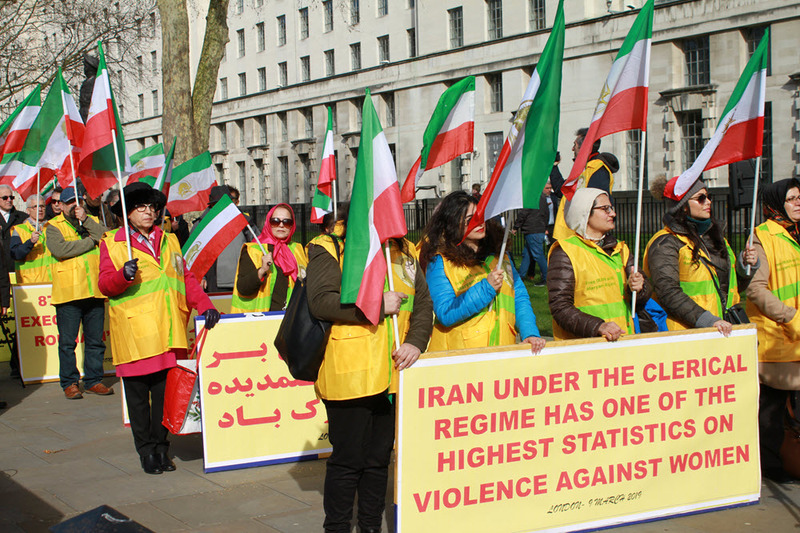 The demonstrators were there to voice the long-suppressed desire of the Iranian people to live in a free state. Ministers from several countries will be discussing the situation in the Middle East and especially the threats posed by the Iranian regime. 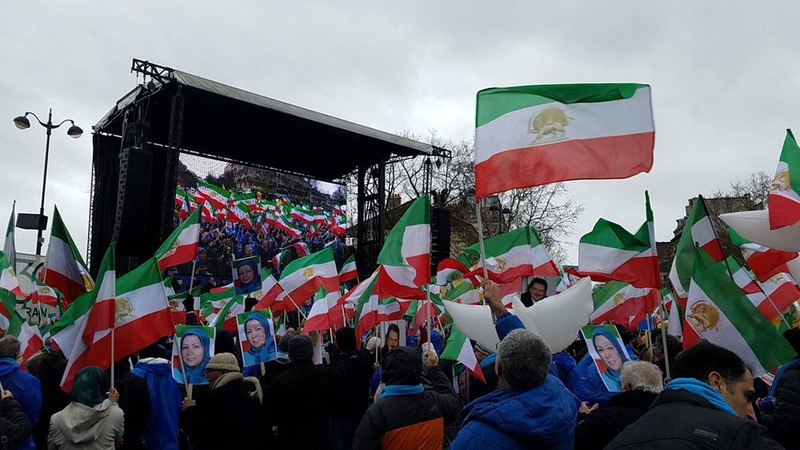 Thousands of Iranians rallied and marched in Paris on February 8, to mark the 40th anniversary of the Iranian people's uprising against the Shah's dictatorship. A message from Mrs. Maryam Rajavi, President-elect of the Iranian Resistance, to the demonstrations was shown on the widescreen. She said, with the overthrow of the Shah’s corrupt dictatorship and his regime of torture, his true successors, namely Khomeini and Khamenei, took over the helms. Now is the turn of the mullahs to be overthrown. She added, our nation has started a new era, a new phase, in her battle to bring down the mullahs’ theocratic rule. Therefore, they expect the international community to respect their struggle and recognize their high goal of liberating Iran and the entire world from the evil and mischief of the mullahs’ religious fascism. Western governments bear double responsibility in this regard because they have had a role in preserving this regime, particularly in the past two decades. 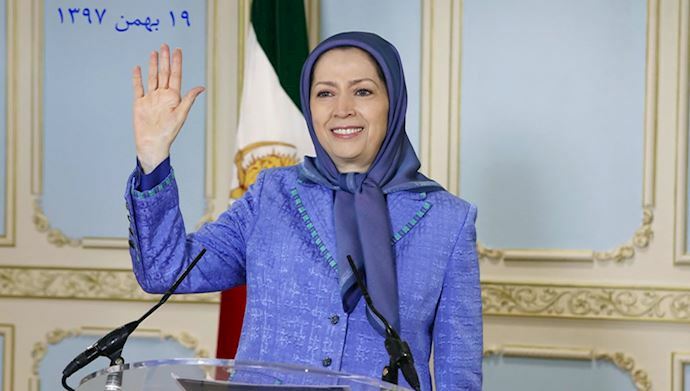 Mrs. Rajavi emphasized the end to the region’s crises lies in recognition of the Iranian people’s right to resistance to topple the mullahs’ religious fascism and attain freedom. This is the heart of the solution to the Iranian problem, and the road to peace and tranquility in the region and the world. She concluded: Prevent the regime’s access to missile programs and any form of arms and equipment. 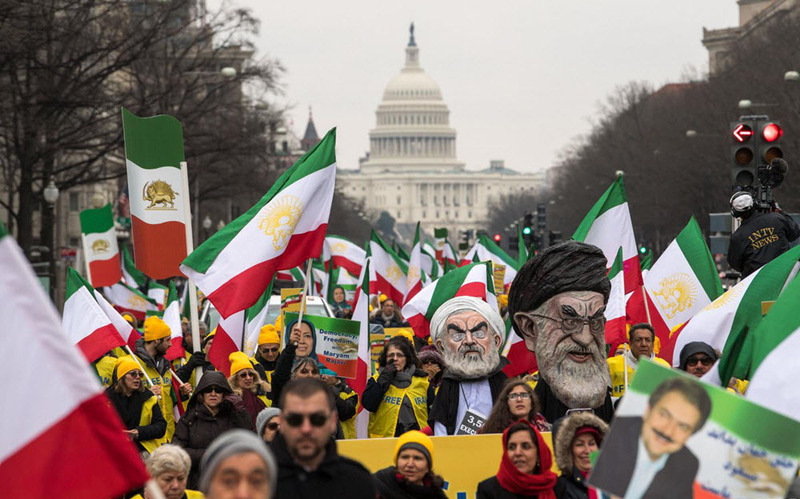 The Iranian people and Resistance do not want this regime to have any bullets, or sell any barrel of oil, or spend a single dollar of the Iranian nation’s wealth on suppression and terrorism. 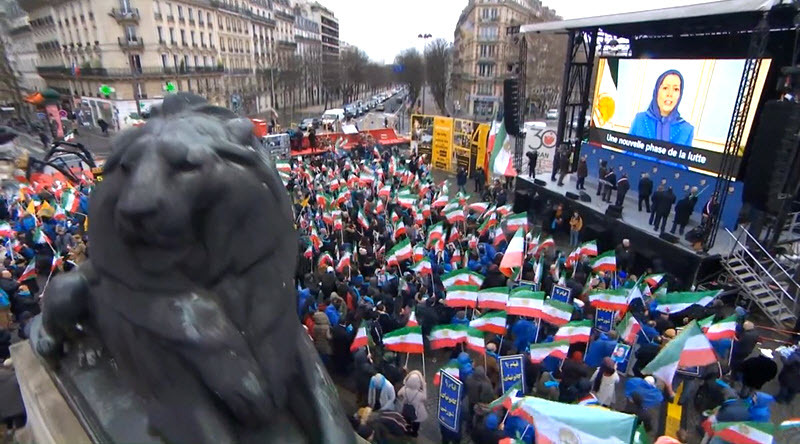 The gathering was supported by a large number of Iranian communities in Europe, human rights organizations, trade unions, and parliamentary committees and mayors from Paris’s districts and the Île-de-France region. Personalities who addressed the event included: Gilbert Mitterrand, President of France Libertés - Foundation Danielle-Mitterrand; Michèle de Vaucouleurs, member of France's National Assembly and President of the French Parliamentary Committee for a Democratic Iran; Sid Ahmed Ghozali, former Prime Minister of Algeria; Alejo Vidal Quadras, former Vice President of the European Parliament and President of the International Committee In Search of Justice; George Sabra, prominent representative of the Syrian opposition; Jean-François Legaret, Mayor of Paris' 1st District; Gérard Lauton, representative of France's National Union of Higher Education; Jean-Pierre Michel, former Senator and founder of the French Committee for a Democratic Iran; François Colcombet, President of the Foundation for Middle Eastern Studies (FEMO); and Pierre Bercis, President of Nouveaux Droits de l'Homme. Paris, Feb. 8, 2019 - Iranians from across the globe rallied in Paris on Friday calling for a free Iran and seeking regime change by the Iranian people and their organized opposition, the National Council of Resistance of Iran (NCRI). “The Iranian authorities are celebrating the anniversary of 40 years of revolution. They’ve used the economy of Iran for war and corruption,” said Gilbert Mitterand, President of the Fondation France Libertés - Danielle-Mitterrand Foundation..
Feb. 26, 2019 - Retired government employees, along with retired military personnel, rallied on Tuesday outside the regime’s Majlis in Tehran, the capital of Iran, protesting poor living conditions, discrimination and the violation of their rights. These retirees have long been demanding the mullahs’ regime provide the pensions they are entitled to under law. 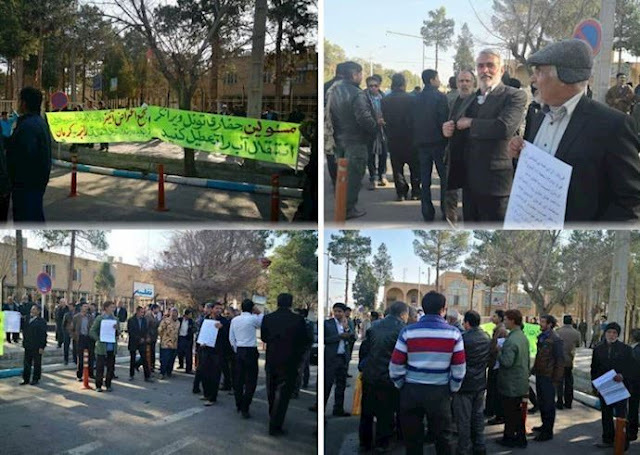 Feb. 24, 2019 - On Sunday, a large crowd of Iranian teachers, educators and retired public sector workers gathered in front of the Majlis (parliament) to protest against the regime’s incompetency and neglect in responding to their most basic demands. The protests are taking place while the Majlis is discussing the budget for the next Persian year (starting March 21), which will also include the salaries of public sector workers. Feb. 21, 2019 - Various cities throughout Iran witnessed a large number of protests by people from all walks of life. 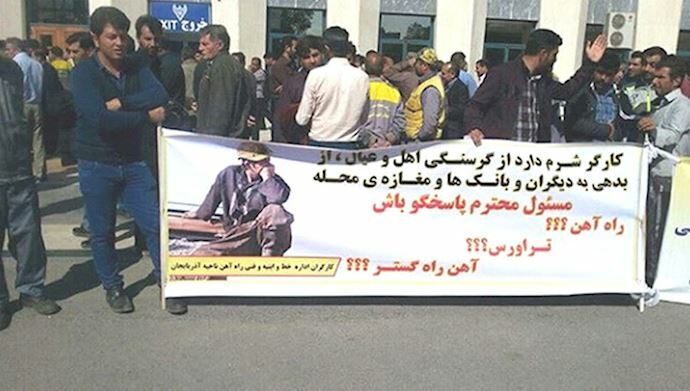 Storeowners in Tehran, people who pre-ordered vehicles from state-run companies of Changan and Saipa, retired employees of the Haft Tapeh sugarcane mill in Shush and Torbat-e Heydarieh, municipality workers of Khorramabad and Zanjan, employees and workers of the East Azerbaijan Province Communications Company, and workers of the “Jahan” vegetable oil company all held protest rallies seeking answers to their rightful demands. 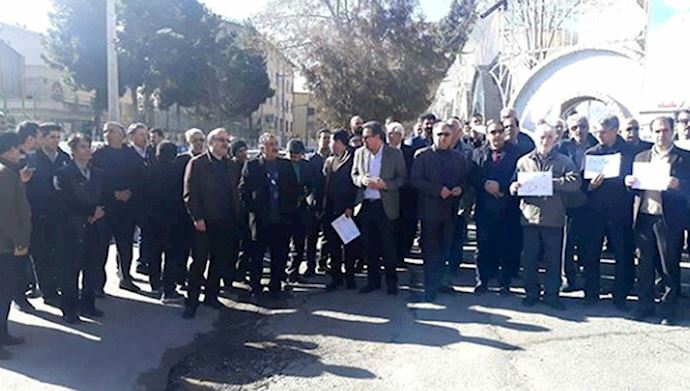 Feb. 19, 2019 - The workers of Jahan Vegetable Oil Company in Zanjan, Azerbaijan province, have been protesting for several days over the privatization of the company and eight months of unpaid wages. On Sunday, the workers held the third consecutive day of their demonstrations in front of the governor’s office in Zanjan. 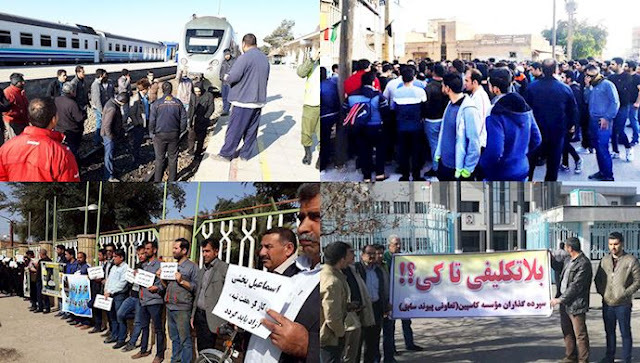 Feb. 17, 2019 - In recent weeks, strikes and protests by railroad workers in different regions of Iran have intensified. Most of the striking workers are employed by contractors companies like Travers, and their salaries aren’t guaranteed. In some cases, the workers have not received their pay for more than 20 months. These workers don’t have official contracts and are being forced into unfair conditions by their employers, sometimes called “white contracts.” There’s no legal and judicial backing for their most basic right, which is being compensated for their hard work. Feb. 15, 2019 - On Thursday, teachers in several Iranian cities held demonstrations in protest to the Iranian regime’s suppression of activists, poor work conditions and low pay, among other demands. 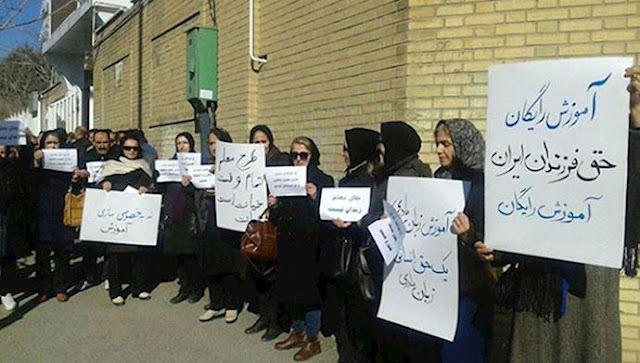 Teachers and retired educators in Ardebil, Kermanshah, Marivan, Mashhad, Urmia and Sanandaj held rallies in tandem and called on the regime to respond to their demands, which they’ve been reiterating regularly for most of the past year. According to reports, the Iranian regime had dispatched plainclothes agents and suppressive forces to disperse protesters in various locations. There were nine protest rallies held across Iran on Sunday, with several different groups in the capital Tehran demanding to be paid for their work, while elsewhere people were demanding the return of their looted money and others were calling on the Iranian government to protect the environment. Let’s look at them in more detail. Feb. 8, 2019 - Hundreds of teachers in Isfahan, central Iran, rallied alongside the city’s famous Zayanderud River on Thursday, protesting the mullahs’ unjust policies, including the drying up of Zayanderud’s waters, and demanding changes. People from all walks of life were seen joining the protesting teachers in this gathering. The protesters were criticizing the judicial system for taking no action against the high level corruption that has been plaguing the country’s financial system. “Why isn’t the law enforced in our country?” the protesters were shouting. Feb. 3, 2019 - On Saturday, students of the Science and Research unit of Tehran’s Azad University gathered to commemorate 10 students who lost their lives 40 days earlier in a bus accident, a ritual that is part of the Shiite Islam culture. On December 25, a bus carrying students from the Science and Research unit of Tehran’s Azad University veered off a steep, mountainous road and crashed into a cement block, causing the death of 10 passengers and injuring 28 others. Jan. 31, 2019 - Among the different segments of the Iranian population regularly protesting against the tyrannical rule of the mullahs, the demonstrations and strikes of teachers are especially notable. As the mentors of the future generations of Iran, the freedom-loving teachers of Iran have been constantly protesting since the end of 2017, when protests erupted across Iran. While pursuing their just demands, the teachers of Iran are regularly manifesting their intellect by holding gatherings at the tombs of historical figures such as Mirza Zadeh Eshghi, the revolutionary journalist who was murdered by the dictatorship of Reza Khan. 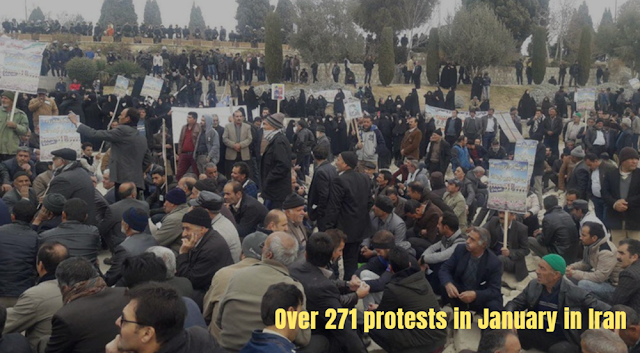 Jan. 27, 2019 - Saturday saw more demonstrations and strikes in different Iranian cities. Economic woes, corruption and government mismanagement have become the principal source of protests by different segments of the Iranian population. Jan. 26, 2019 - People who have purchased vehicles from the Iran Khodro and Saipa companies held a rally today in Tehran, the capital of Iran. These angry customers are protesting the car company officials’ refusal to provide the cars after they have been paid for. 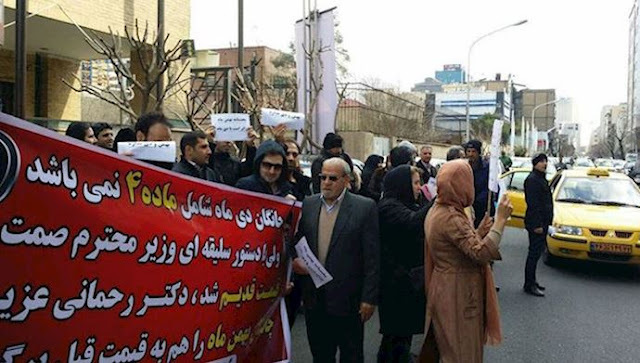 Protesters were seen chanting, “Iran Khodro and Saipa are associated to the mafia," a term regularly used by protesters in various cities to reference government-run financial corruption. Teachers across Iran protesting delayed paychecks Jan. 25, 2019 - Teachers in the provinces of Kermanshah, Alborz, Isfahan and Ardabil rallied on Thursday, protesting delayed paychecks and poor living conditions. Skyrocketing prices of every day goods and inflation are becoming major concerns for these hard-working and yet deprived teachers throughout the country. Tehran, the capital of Iran, was the scene of clients of the Caspian credit firm protesting and demanding their stolen money returned. The Caspian credit firm is known for its direct link to the Revolutionary Guards (IRGC). Jan. 20, 2019 - Protests are reported from numerous cities across Iran on Sunday. 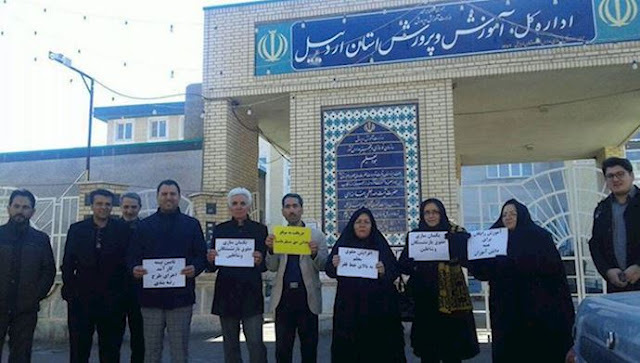 More than 150 volunteers of medical sciences in Tehran’s Azad University held a rally outside the regime’s Majlis (parliament) protesting their limbo education status. 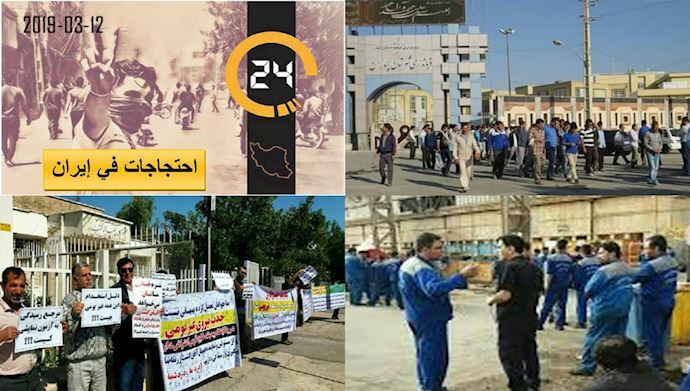 On Saturday, the Free Union of Workers published a statement, in which it condemned the repressive conditions set against workers of Ahvaz who were recently release from prison on bail. “The extraction of a 2.5-billion-rial bail from the families of Karim Siahi and Tariq Kholfi shows that wave of repression continues against the workers of Iran National Steel Industrial Group, who were demanding for their most basic rights during their 38-day strikes and streets protests,” the union wrote in its statement. 2019 - On Wednesday, more than 200 customers of state-run Iran Khodro vehicle manufacturer held demonstrations in front of the offices of the Ministry of Industry. The demonstrators, who had registered in advance to purchase vehicles at discount prices, are protesting against unfair practices and the increase of prices against commitments made by the manufacturer. Jan. 17, 2019 - On Wednesday, the workers of the Ahvaz Urban Train project held a demonstration in front of the headquarters of the organization in Ahvaz, Khuzestan province, and continued their protests to unpaid wages. 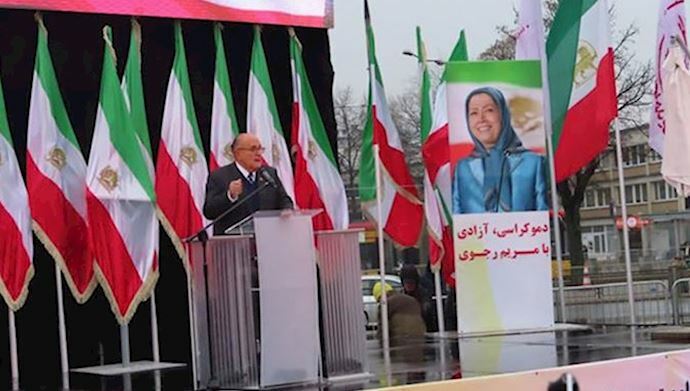 Jan. 16, 2019 - Ali Rabie, a Deputy Intelligence Minister of the Iranian regime and a former labor minister, made startling remarks in an interview signaling how people in 160 cities across the country held protest rallies during a nationwide uprising that began at the end of 2017. These protests may be repeated, he added. Jan. 16, 2019 - A year after the Dec/Jan 2018 uprising that swept over 140 cities across the country, this year there is a seemingly unstoppable trend of reports of protests coming from throughout the country. 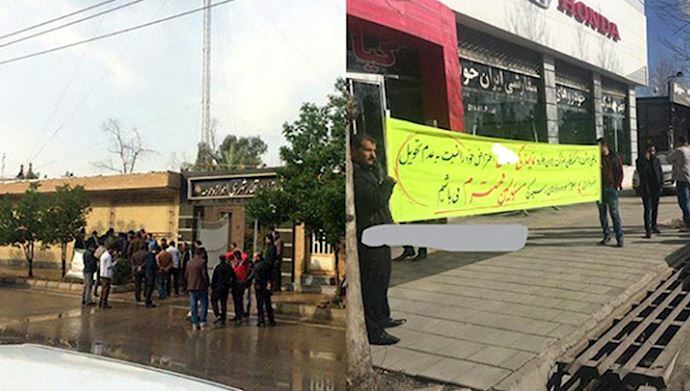 On Tuesday, the customers of Caspian Credit Institution held a demonstration in front of the offices of this organization in Rasht and demanded the return of their plundered investments. Protests in Tehran, Mashhad and Ahvaz Jan. 15, 2019 - On Monday, several cities across Iran witnessed protests by angry people whose rights have been trampled by the Iranian regime and its affiliated companies and organizations. Various protests reported across Iran Jan. 14, 2019 - Numerous cities throughout Iran witnessed protest rallies on Sunday by people from all walks of life. Protests continue in several Iranian cities over financial corruption and government-backed fraud On Sunday, customers of Caspian credit institution held a demonstration in Tehran, stressing they will continue their protests until their stolen funds are returned to them. 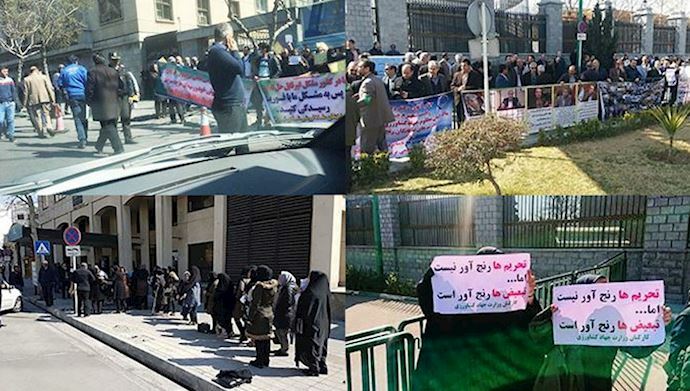 The protesters were calling on the Majlis (parliament) and Iranian regime officials to stay true to their own laws and to hold the perpetrators of a large Ponzi scheme that has robbed millions of people of their investments to account. Protests and strikes in Tehran, Shadegan and Yasuj Jan. 13, 2019 - On Saturday, demonstrations and strikes continued in various cities of Iran. A group of customers of Bahman Khodro vehicle manufacturer gathered in front of the headquarters of the company in Tehran and held demonstrations in protest for not having received their purchased vehicles. 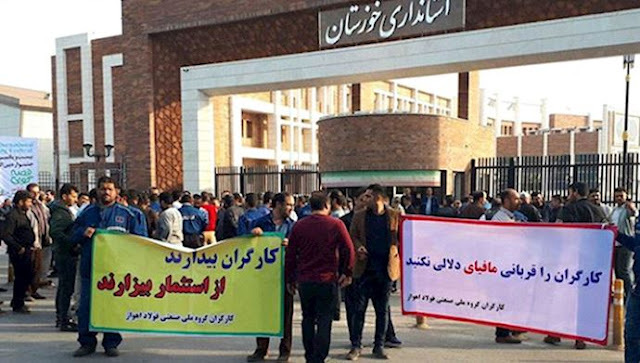 Workers of Haft Tapeh sugar mill go on strike again Jan. 11, 2019 - On Thursday, the workers of Haft Tapeh sugar mill, located in Khuzestan province’s Shush city, went on strike and demonstrated in front of the offices of the managers of the company. Tehran car purchasers protesting authorities’ failures On Friday, purchasers of Iran Khodro and Saipa, two state-owned Iranian vehicle manufacturers, held a rally in Tehran, protesting these two companies’ pricing policies and refusing to deliver the vehicles purchased by these individuals. This rally was held at Tehran’s auto exhibition. On Thursday, teachers were seen holding protests in a variety of cities across the country in Iran. Farmers of Varzaneh hold large gathering in Isfahan Jan. 10, 2019 - On Wednesday, famers of Isfahan’s Varzaneh gathered in Isfahan’s Golzar mosque in protest to the trampling of their rights to water by the government. In the past weeks, the farmers of Varzaneh have been continuously protesting to water shortages stemming from the destructive policies of the Iranian regime. Jan. 7, 2019 - On Sunday, hundreds of employees of the Agriculture Insurance Fund from across the country gathered in Tehran and demonstrated in front of the building of the Recruitment Organization. In Varzaneh of Isfahan Province, central Iran, farmers held a protest rally on Sunday, gathered in the city’s Darvazeh Abbas district and went on to march through the streets, protesting not receiving their share of river waters. The workers of the Iran National Steel Industrial Group condemned the brutal behavior of Iranian security forces and the arrest and torture of their colleagues in a statement. Iran, Jan. 4, 2019 - On Friday, the farmers of Varzaneh, east Isfahan, returned to the Darvazeh Dolat square to hold demonstrations in protest to the government’s policies that have resulted in their deprivation from water to irrigate their fields. On Sunday, the Iranian regime held “anti-demonstrations,” government-organized gatherings meant to prevent protests from erupting on the anniversary of the “Ashura uprising” in December 2009, where thousands of people poured into the streets of different cities in Iran and confronted security forces in heavy clashes. However, despite the widespread efforts led by the regime, the events turned out to be very desolate, with very few attendants, mostly agents of the Revolutionary Guards and the Basij. Jan. 1, 2018 - Numerous cities across Iran witnessed a variety of protest rallies on Tuesday. 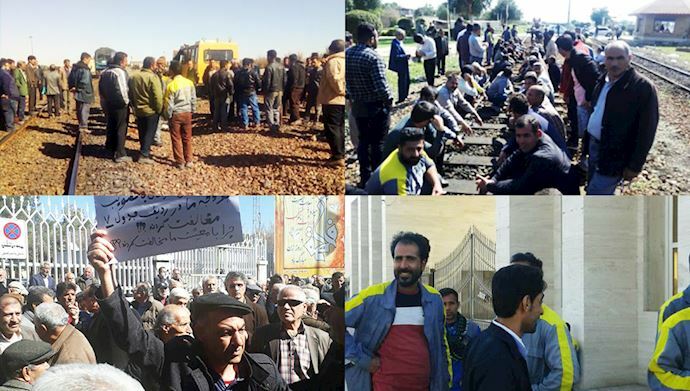 In the town of Varzaneh of Isfahan Province, central Iran, hardworking farmers took to the streets once again, protesting the policies of Iranian regime authorities rerouting local river waters for government and Revolutionary Guards (IRGC) projects. These initiatives are leaving locals deprived of any water for their lands.